I've been inspired by all the book paper ornaments on Pinterest, so I decided to take a crack at some my own. I also have a super fun and funky paper garland in the works - not the ruffle one you've probably seen already, but a new design I've been fiddling with. Ok. So. Tutorials. Keep scrolling for how-to's on the bows and pinwheels! Once you have a template for the bows they're super quick to make. Try to keep the sides even, but don't worry if they're not perfect; we'll fix that in a sec. 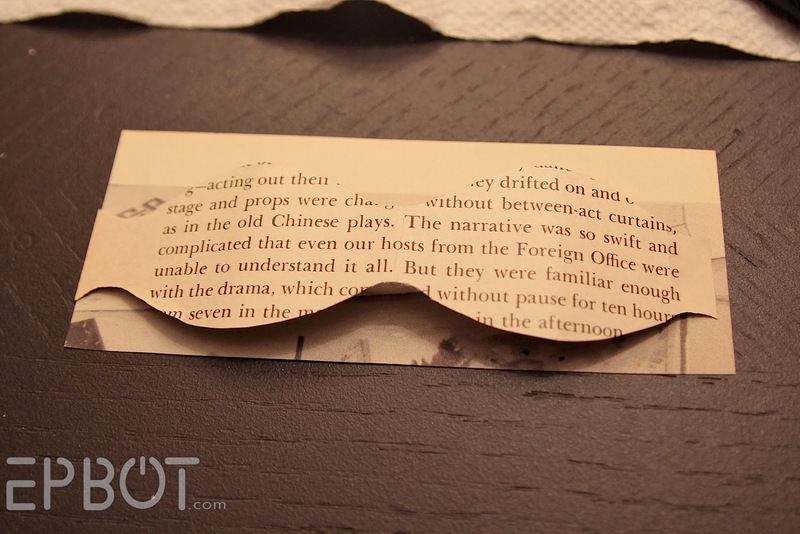 Fold the goggles at the nose piece to check your symmetry; make any necessary trimmings. 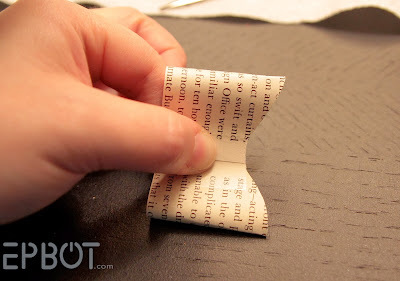 Once everything is even, use your new template to trace as many bows as you like! 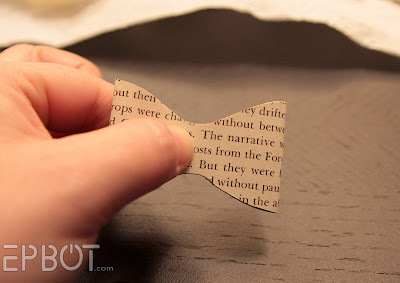 Finish your bows off with small strips of paper for the center knot, taped in the back. (I find a blank strip from the margins contrasts nicely for the center, but that's your call.) You could also cut little tails! 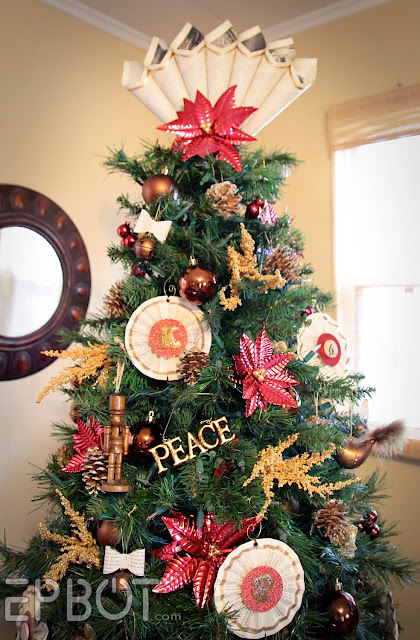 These would be cute on their own, or you can add them to smaller ornaments like I did (the bronze bells are $3 for a pack of 5 at Target), or put them on wreaths, garlands, gifts, etc. These take a little patience, but they pack a big punch design-wise. Plus there are SO many fun things you can glue in the center! 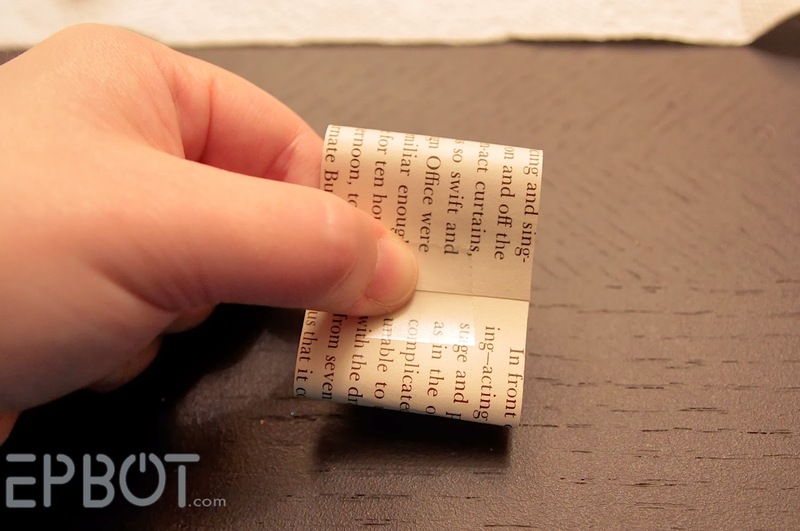 To begin, rip out your book pages and trim off the rough inner edge. Now's the time to add a gold paint stripe, if you like. (It adds sparkle.) 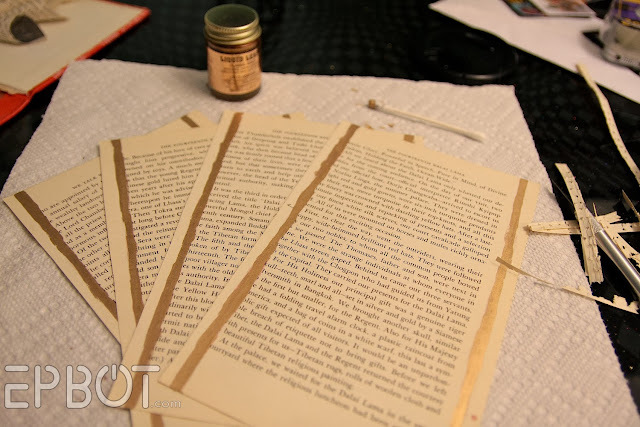 I used liquid leaf with a Q-tip because I wanted a rough line (to look more handmade), but you could also use a brush or gold paint pen. Once your pinwheel is taped, the real fun begins: DECORATING. 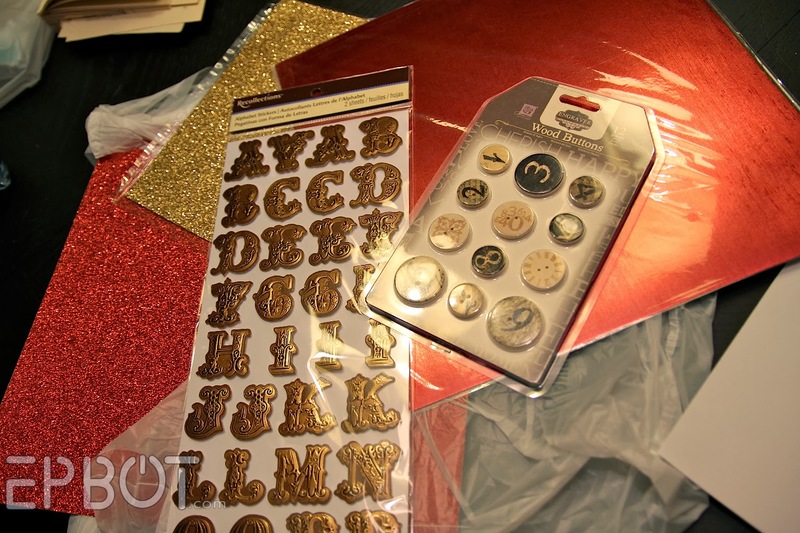 I cut circles from two kinds of cardstock (one glittery, one textured like silk) and topped those with Alphabet stickers and wooden button embellishments from the scrapbooking aisle. A little glob of E-6000 keeps it all in place nicely. I had to add an additional ring so the fancy hooks would hang right, but I think the finished product is worth the effort. Plus these are fairly large on my little 6 foot tree, so I only needed 8 or 10 total. (I originally planned to hang a small gold tassel off the bottom edge, but that'd be way too big for my tree! 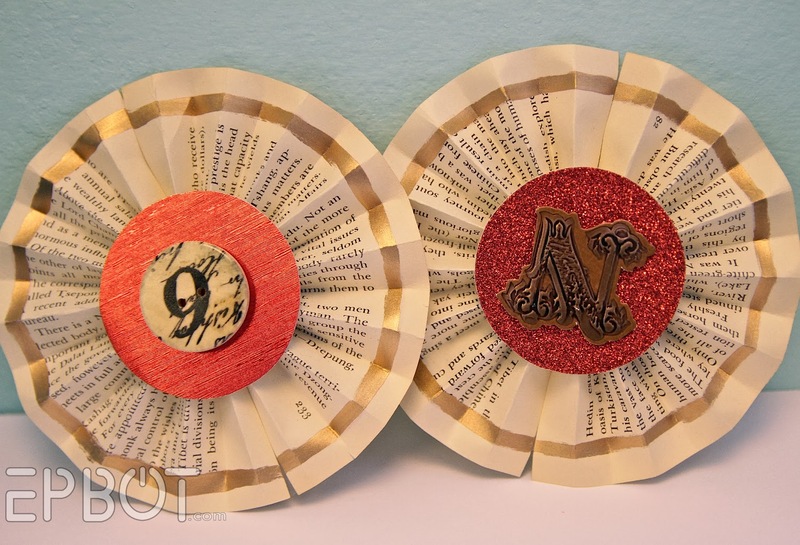 The pinwheels are surprisingly sturdy, btw, so don't let the fact that they're paper scare you off. I've knocked them around quite a bit, and it takes actual effort to rip or dent them. I don't think there's any room left for my paper garland! Huh. Guess we're gonna need a bigger tree. So how'd your weekend's crafty exploits go, guys? Please share pics over on the Epbot FB page; nothing cheers my geeky little heart more than seeing other people's holiday crafts & decorations! 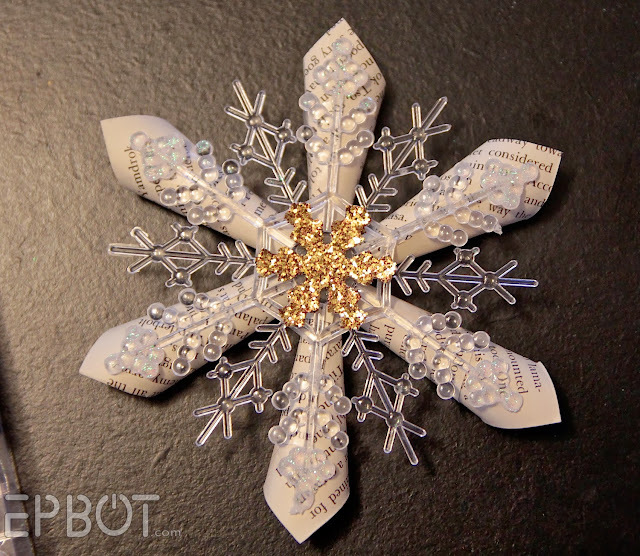 Very cool paper ornament ideas. Looking forward to seeing the paper garland. Beautiful! Where did you get the fancy hooks to hang your pinwheels? I think I saw them at Big Lots too. 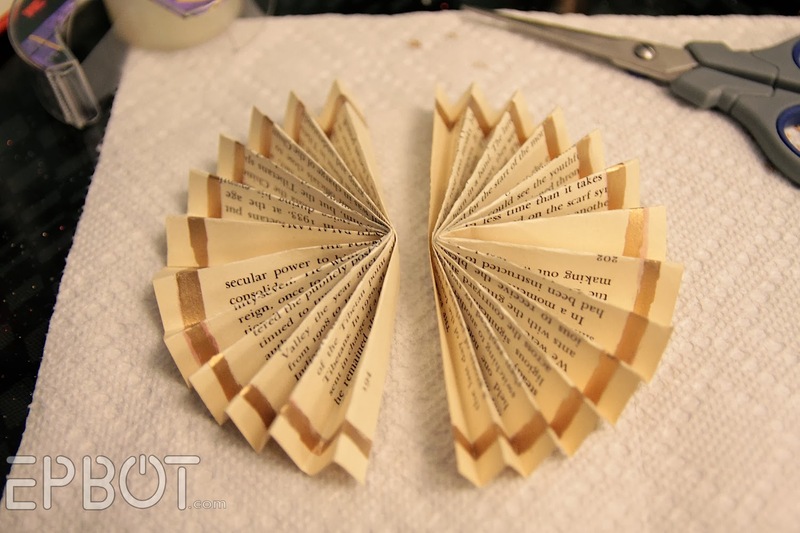 And I would love to have a crafting buddy...if only I had the time and space. 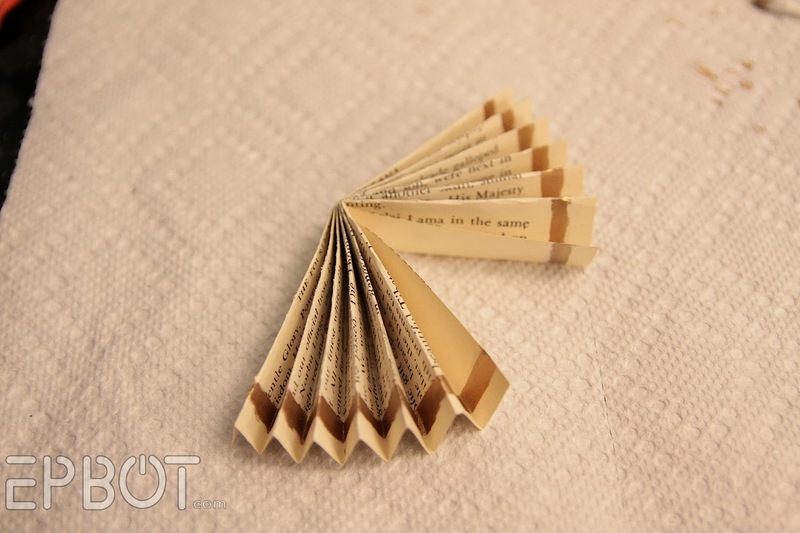 I LOVE the book page crafts, but I find myself hesitant to murder books. *sigh* Also, I wanna do crafts with you, Jen. Is that weird to say? That might be weird. 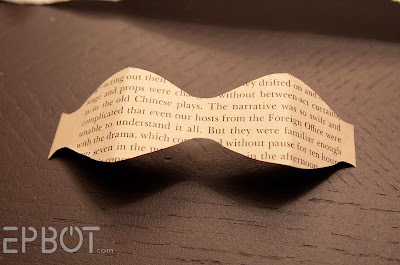 Recycling - I like that. I love these, but was physically pained at the idea of taking apart a book to do it. The word you're looking for instead of pinwheel is rosette. Or if you want to be even MORE accurate (though obsolete) it's called a cockade. "The narrative was so swift and complicated that even our hosts from the foreign office were unable to understand it all." Ahh, thank you. I tried to look it up, but all I got were movie reviews talking about narrating. Right?! I promise all the rest are rightside-up; I didn't even notice this one 'til I was editing the photo! Ha! While the crafts are pretty, I just couldn't help but cringe at the thoughts of books being treated this way. 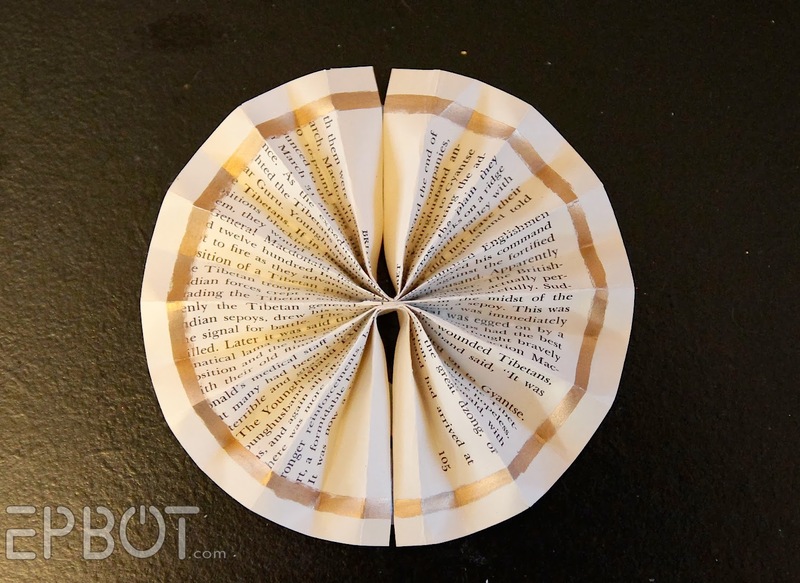 If I ever make some of these, I may resort to some pretty scrapbook paper instead. I wouldn't want to murder books either. But I'm thinking: paper of a similar quality + laser printer = murder-free book crafts. 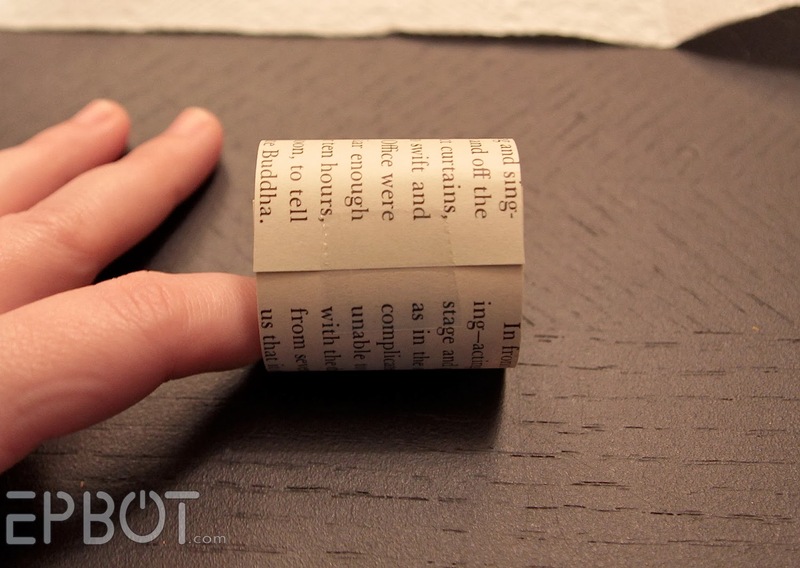 This looks like a great way to memorialize one of my favorite books that has fallen apart! The binding is completely broken (perhaps read too many times, carried around too much? ), and pages are falling out. A replacement copy is inexpensive, but I've been reluctant to toss my old friend in the recycling after all our years together. 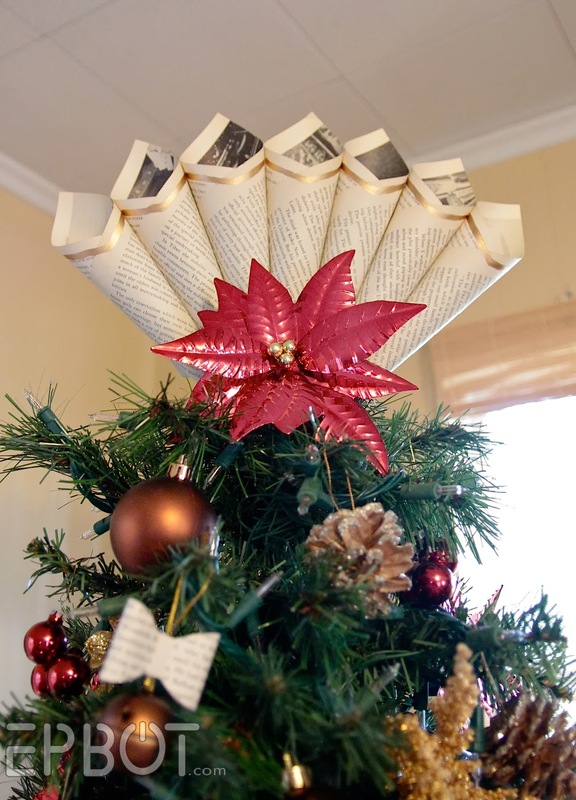 I've been trying to think of a way to preserve it, and I like the accordion pleated ornaments! 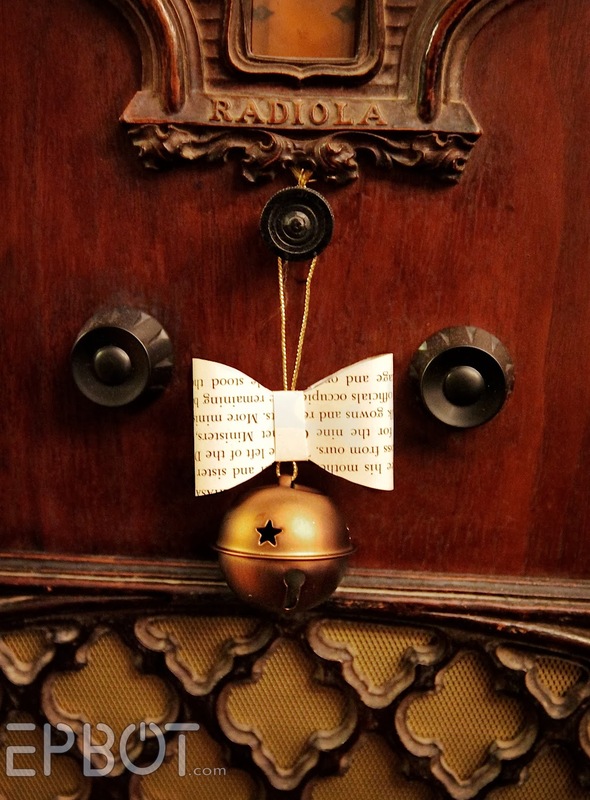 I'm inspired to decorate the centers with bits of things that remind me of the story and the times I've read it. Now the million dollar question...will I ever actually get around to doing it, and would I ever finish it once I started?! I'm notorious for rarely finishing the things I start...sigh. 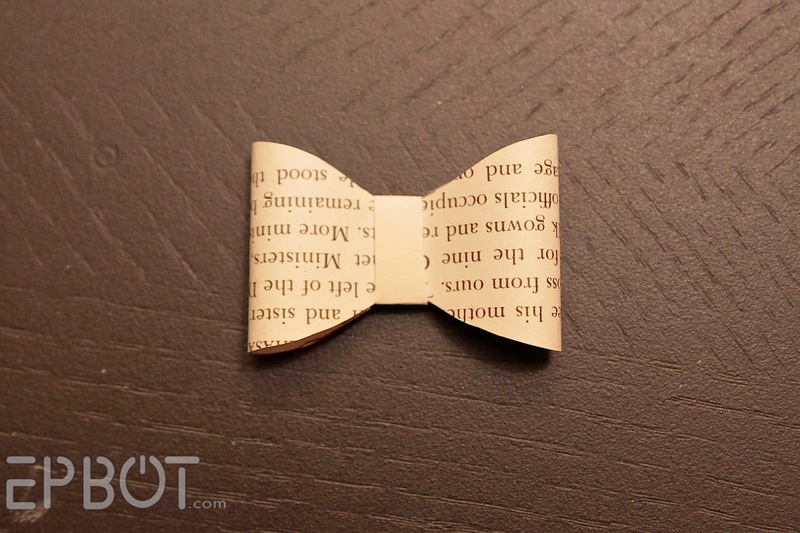 The bow with bell is so cute! I really like the bow and bell! But I don't have a book to cut up...although I have a thousand books. Sheet music...there's an idea. HUm, I have some Halloween buttons that I was trying to find projects for... perhaps some ornaments now! Making reversable fabric baskets. Cut 2 each: outer fabric, interfacing, inner fabric that is 10" wide and 8" tall. Sew 1 short, 1 long and 1 short side on outer and then repeat on inner with interfacing. Measure 1 1/2" down each seam FROM the point, sew across to make a box end. Cut off the tip. Flip outer bag so right sides are together and stitch along the top edge. Leave 4" as an opening to turn. Do so and iron flat. Topstitch around and done. Now put your keys, dog leash, clicker, Ipod charger, cat treats or loose change in it. Now you are crafty AND tidy! Got this idea from Craftgawker but I forgot which site. 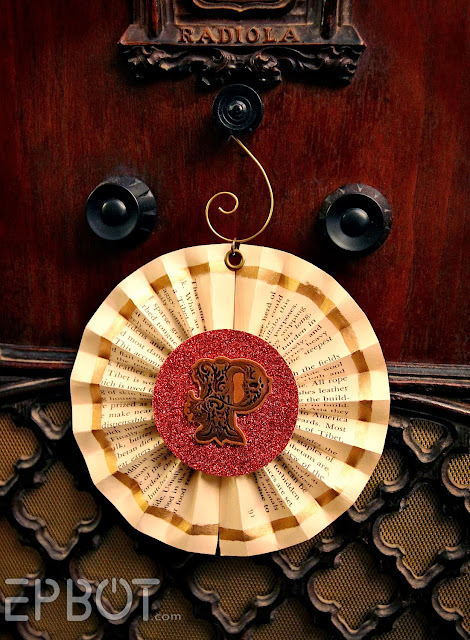 Mix an eye for design with artistic talent and hey presto: Exquisite recycling. P.S. I wouldn't have been anonymous but I have no idea what any of those things are or what my URL is. I came here to comment specifically because every time someone does a cool book related craft there are approximately eleventy billion comments to the effect of "Oh Noes!!! They killed a book!!!" Don't be afraid to give damaged and outdated books a new life!